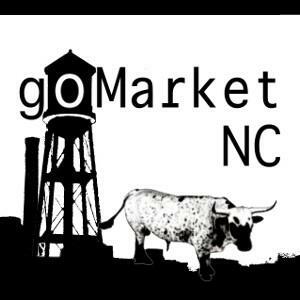 goMarket is a new food hub in Durham, NC. Like other food hubs, we help farmers connect with eaters. Sometimes described as an online farmers’ market or multi-farm CSA, goMarket, like other food hubs, helps coordinate supply and demand, reduce food waste and simplify the lives of farmers and eaters. When I was managing a farm for the first time in Athens, GA, I had a bunch of crops ready to sell and then found out I was months late to apply to sell them at the downtown farmers’ market. Dozens of producers get turned away every year at traditional farmers’ markets. Like me at the time, a lot of them are beginning farmers. Athens’ online food hub helped me cut my losses that year and though I don’t have land anymore, it’s essential that we support these farmers right from the beginning. Like many people, I like to support independent, sustainable farms, but don’t always make it to the farmers’ market. Sometimes it doesn’t fit with my schedule and other times I’ve been disappointed when I arrived too late and no one had any more Sungold tomatoes. Sometimes I forget half of my list after bumping into friends. Online foodhubs can help connect these conscious customers directly with farmers that can’t get into Durham’s premier farmers’ market anyways. Browse dozens of farmers (and other vendors) Thursday (or earlier) through Monday at noon. Than, with your orders in hand, farmers and artisans know exactly how much to pick, pack, prepare and deliver. After that, just come get your order Tuesday at The Bar Durham from 4:30-7pm (and maybe hang out over a $3 local pint). goMarket is like a collaborative CSA but totally flexible and customizable. We work with some of the smallest farms and food businesses in town and help them grow. Your dollars go further when the businesses you support are smaller. Two-thirds of goMarket business owners/operators are women. We are proud to support these entrepreneurial women and hope you’ll join us in supporting them. goMarket minimizes food miles. Half of our vendors are less than 3 miles from our pickup location on Rigsbee. We feature urban farms like Sweet Beet City Farm and Homegrown City Farm. Even small backyard gardens can “goMarket” themselves. Email eric||at||gomarketnc.com to inquire about sales opportunities. goMarket is a member-supported service, with a nominal $30/year membership fee. But it’s free to try out the service. Go here to create a new account and then browse the market here. Orders are picked up on Tuesday between 4:30 and 6:30 at the Bar Durham (click here for a map). We’d love to hear from you if you’re an interested farmer, restaurant or customer. Email eric@gomarketnc.com with any questions. Click here if you want to learn more about me. To learn more about our vendors, click here.